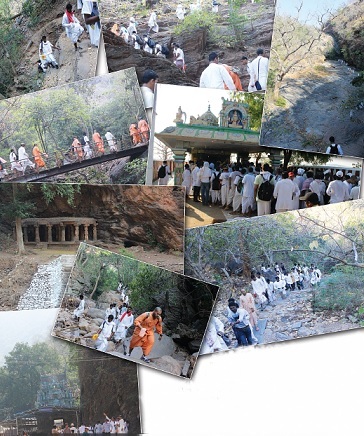 A holy Place situated amidst mountains and forests offers exciting devotional experiences to a young group of devotees. "Let's go to Ahobilam! "everyone shouted unanimously after considering several options for taking a group of college students on a yatra, a spiritual trip. "It will be the best place to give our devotees a wonderful experience of a lifetime." Ahobilam is a holy place located in Andhra Pradesh that is associated with the pastimes of Lord Nrsimhadeva. 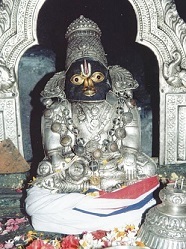 It is said that Lord Nrsimhadeva, after killing the powerful demon Hiranyakasipu, blessed the child saint Prahlada here. The place is surrounded by dense forests, and several wild animals like bears and tigers are said to be living there. Within these forests, on mountaintops, are located nine temples of Lord Nrsimha, all having different forms and moods that the Lord manifested in order to please his devotees. More than 500 young men, college students and working professionals, had taken a break from their schedules to visit this holy place. All of them were excited and ready to face the challenge of trekking the forest mountains in order to get the divine blessings of Lord Nrsimha. After arriving on March 6, we assembled at the Prahlada- Nrsimha temple at Lower Ahobilam in the evening to hear a discourse on the pastimes of Lord Nrsimhadeva. The Seventh Canto of Srimad -Bhagavatam discusses the pastimes of Lord Nrsimhadeva and tells us how he protected Prahlada from the atrocities of his father Hiranyakasipu. 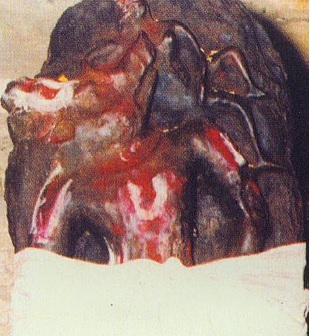 We discussed in detail the character of Hiranyakasipu, one who embodied all demonic qualities. Chapter Sixteen of the Bhagavad-gita describes in great detail the attitude and behavior of demons. A devotee must be extremely careful to carefully avoid such behavior but instead develop the saintly qualities of Prahlada. Despite being surrounded by demons, Prahlada was least affected and he maintained his faith and devotion to Lord Visnu fearlessly. This understanding of both characters was essential so we could cultivate the right mood while visiting the temples and pray with a devotional attitude before the nine Deities. We divided ourselves into two groups, 300 in each, so it would be easier to take darsana at the various temples. Both groups went in different directions and planned to cover different temples. The trek started from Upper Ahobilam, about eight kilometers away from Lower Ahobilam. We all went by the local state transport buses, which we had booked several weeks ago. Upon getting down, we beheld the massive mountains looming ahead of us. I could feel a current of excitement running through my body. Having visited Ahobilam several times before, I was familiar with the area, so I was told to lead everyone through the winding paths and forest lanes that led to the various temples. We began with Ahobila-Nrsimha temple located at the very beginning of the climb. The Lord is in his fiercest form here and is therefore called Ugra-nrsimha. The temple is situated in a naturallyformed cave, and one has to bow down in order to get inside the main altar while taking darsana. Upon leaving the Ahobila-Nrsimha temple, we see wooden bridges that allow us to cross valleys along the Bhavanasini River that flows down the mountains. Within a distance of one kilometer, you find the temple of Varaha Nrsimha, the combined form of Varahadeva and Nrsimhadeva. 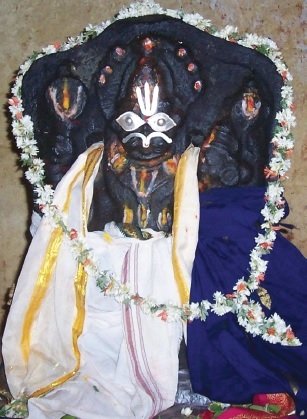 Bhu-devi is seen embracing the snout of Lord Varaha. A path leading upwards from Varaha-Nrsimha temple takes us to the temple of Malola Nrsimha. Ma means “Mother Laksmi” and lola means “beloved,” or, in other words, the temple of Nrsimhadeva with his beloved Laksmi Devi. About a kilometer away from this temple, on the same mountain, there is Prahlada-mettu, or the school where Prahlada Maharaja is said to have taken education. 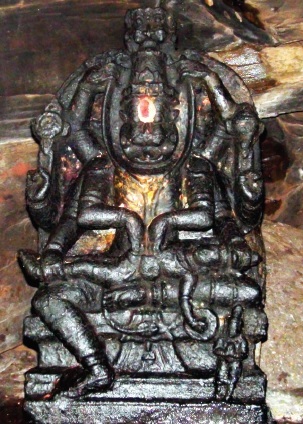 There is a small temple of Nrsimhadeva inside a cave. Two kilometers further up is the temple of Jvala Nrsimha, one of the most attractive Deities among the nine. It is said that Lord Nrsimhadeva killed Hiranyakasipu at this spot. The main Deity here has eight hands, and the Lord is seen tearing the demon’s abdomen and garlanding himself with the demon’s intestine. Two other hands are holding sankha and cakra. 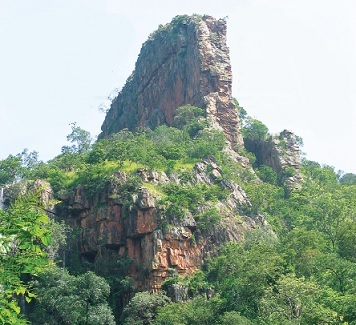 From here there is a steep climb towards ugra-stambha, the pillar from which Lord Nrsimhadeva is said to have emerged after Hiranyakasipu angrily struck the pillar. This temple is located on a different mountain range and is located about seven kilometers from Ahobila Nrsimha temple. Our group visited this temple on the second day. Located a few meters above is the temple of Chenchu (Laksmi). 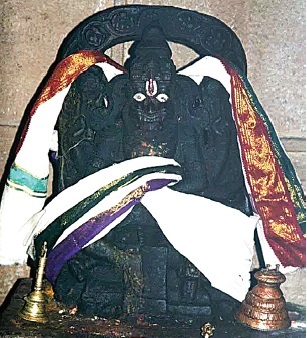 This temple is located on the road between Lower and Upper Ahobilam, about one kilometer from Upper Ahobilam. 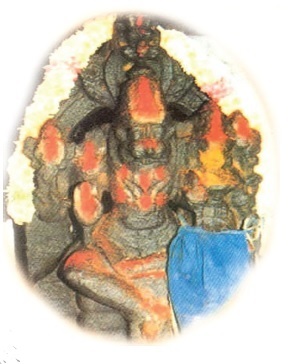 Because the temple is located under a Karanja tree, the Deity is known as Karanja Nrsimha. The remaining three temples are located on Lower Ahobilam. About four kilometers from the main town is the temple of Yogananda Nrsimha, where Lord Nrsimhadeva is said to have taught Prahlada the various yoga-asanas. This temple is located near the Yogananda temple and is under several umbrella-like banyan trees – thus the name Chatravata (chatra means “umbrella”). It is said that two Gandharvas named Haha and Huhu came here and entertained the Lord with their melodious singing. 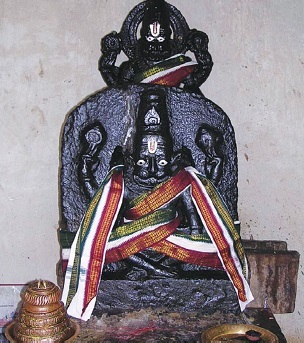 This temple is located near the bank of Bhargava-tirtha, about two kilometers from Lower Ahobilam. 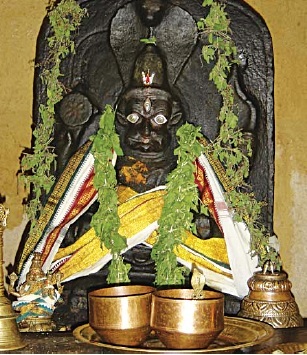 Lord Parasurama (Bhargava Rama) is said to have performed penances here. We didn’t cover all nine temples in one day; we chose to cover them in three days. We would leave in the morning and come back by afternoon. In the evening, we would discuss the pastimes of Prahlada- Nrsimhadeva. Majority of the development work in Ahobilam has been carried out by Ahobilam Matha, who are followers of Sri Vaisnavism of Sripada Ramanujacarya. The 33rd jeeyar (a member of their disciplic succession) is especially said to have carried monumental work in developing this sacred place. The local people narrate an interesting story about him. One day the jeeyar was going from Ahobilam to Mysore through the dense forests, accompanied by his disciples. At one spot, the jeeyar halted to offer his evening worship to his Deity. As he was settling down to offer prayers, a gang of dacoits attacked them. “Surrender everything you have,” the leader of the dacoits demanded. The leader agreed. The jeeyar began his worship. 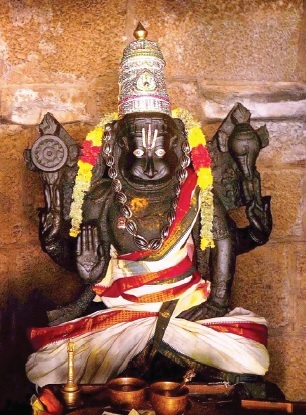 He offered his Deity a sweet preparation named cakkarai-pongal, made out of rice and jaggery. He then offered arati to the Lord three times, and by the time the third arati was about to finish, all dacoits suddenly fell at the feet of jeeyar. “Several lions are attacking us. Please save us!” the dacoits pleaded with the jeeyar. Although there were no wild animals anywhere nearby, the jeeyar realized that it was Lord Nrsimhadeva enacting this pastime to rescue them. He offered prayers to the “lions” to disappear. With a change of heart, the dacoits fell at the jeeyar’s feet begging forgiveness and then escorted all the devotees safely out of the forest. Four days went swiftly, and we didn’t realize how time went by. We were totally absorbed in hearing, chanting and remembering the activities of Lord Nrsimhadeva and his dear devotee Prahlada. Such is the nature of Krsna consciousness. The more we hear and chant the glories of the Lord, the more we become immune to the contaminations of the material world. We all need excitement, thrill and adventure in life, and Krsna consciousness provides everything that material life promises us to offer – and much more. If we keep Krsna in the center of all our activities, then whatever we do becomes pure devotional service. Only if everyone in the world realized this. . . no one would then chase the pleasures that the modern civilization falsely advertizes everywhere.